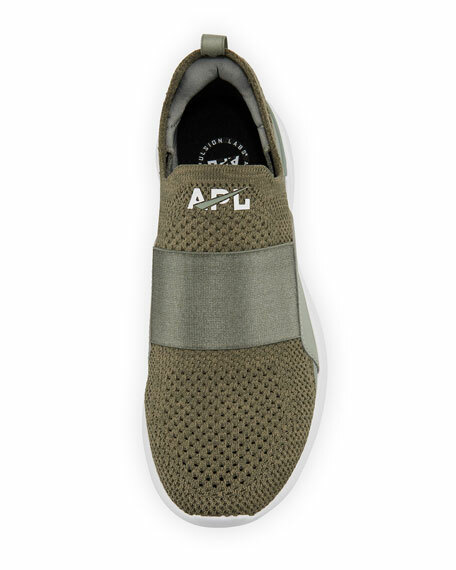 APL: Athletic Propulsion Labs "Techloom Bliss" mesh sneaker. adidas by Stella McCartney colorblock knit-mesh sneaker with iridescent rubber trim. 1" textured flat heel with platform. Reinforced round toe. adidas by Stella McCartney colorblock knit-mesh sneaker with iridescent rubber trim. 1" textured flat heel with platform. Reinforced round toe. Pull-on style. Pull-tab at back collar. Reinforced heel counter. Stretch-sock insole. Boost™ midsole. Rubber outsole. "Ultra Boost" is imported. Adidas stretch-knit sneakers with synthetic trim. Signature 3-Stripes® at sides. 1" chunky flat heel with platform. Reinforced round toe. Lace-up vamp. Logo at tongue. Padded footbed. Rubber outsole. "Edge" is imported. Fendi "T-Rex" sneakers in FF logo-print mesh, leather, and polyester. 1.3" chunky heel with slight platform. Reinforced round toe. Lace-up front. Logo medallion tongue press. Pull-tab at cushioned back collar. Padded footbed. Sawtooth rubber sole. Made in Italy.